The national campaign, which started this week and is running until 23 April, is organised by Keep Britain Tidy and hopes to encourage people to look after their neighbourhoods by organising clean-up campaigns and becoming Litter Heroes. With a team of more than 30,000 people across the UK, most of them engineers working in cities, towns and villages, Openreach is well placed to make a big difference. CEO Clive Selley, said: “We pride ourselves in doing the best job possible wherever we go. As the UK’s largest telephone and broadband network, we recognise our responsibility in making sure our engineers work in a tidy and considerate manner. We do most of our work in the roads and public spaces that people call home, so it’s important we play our part. “The huge scale of our work means we have the potential to really change things. Openreach is leading the build of full-fibre ultrafast broadband across the UK, and as our engineers make the technology of the future available, we’re also placing great importance on doing this in the right way for the communities that we work in. “We are delighted to be supporting the Great British Spring Clean organised by Keep Britain Tidy. It’s a worthwhile initiative and I was proud to join members of my senior management team alongside local volunteers in a clean-up on Felixstowe Beach. We collected a fair amount of rubbish in the time we were there. It really does bring home how much more there is to do and how important it is that we all get involved. The Great British Spring Clean aims to inspire 500,000 people to join forces – in partnership with community organisations, businesses and the government – to collect and safely dispose of litter from streets, parks and beaches, recycling as much as possible. Litter Free Felixstowe is a community group working towards becoming the first UK litter free town. They hope to achieve this by working with schools and businesses in the local area, as well as everyone living in and around the town, to raise awareness and eliminate litter. More than 1,000 people have already signed up since the group formed just over 12 months ago. Openreach engineers work on behalf of more than 600 communications provider to maintain a network that’s more than 170 million kilometres in length. The company plans to reach three million premises with its full-fibre network by the end of 2020, 10 million by 2025, and ultimately most of the UK, if conditions are right. 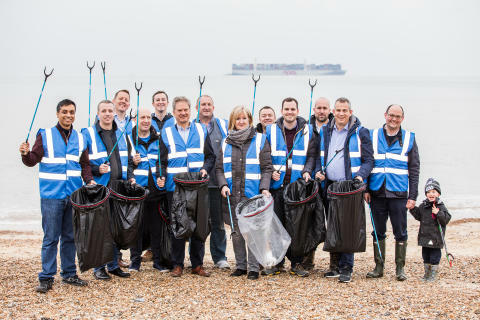 Openreach support for the Great British Spring Clean campaign combines our focus on reducing our environmental impact with a commitment to a culture of employee volunteering. All employees are awarded three days per year to volunteer with close to 5,000 supporting a range of charities, community groups and schools in 2018.